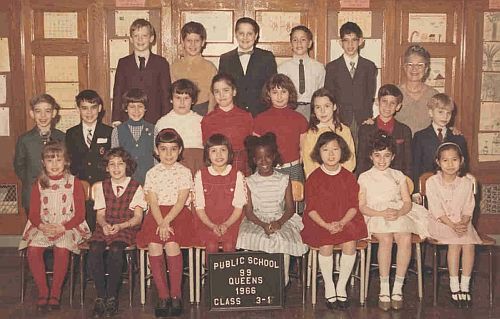 A Picture History of Kew Gardens, NY - Class Pictures - PS99 Grade 3-1 1966. Front Row (Left to Right): Louise Langer, ?, ?, ?, ?, ?, Juliette Levian, Suzi ? 2nd Row: Steven Reynolds, Billy Francullo, Lisa Gussack, Michelle Adoram, Mindy Rubin, Margarita Wlodingeur, ?, Marc Goldberg, ?. 3rd Row: Torbin Karlson, ?, Charles Fiorentino, Bruce Wasser, Howard Roth, Mrs. Gusten.